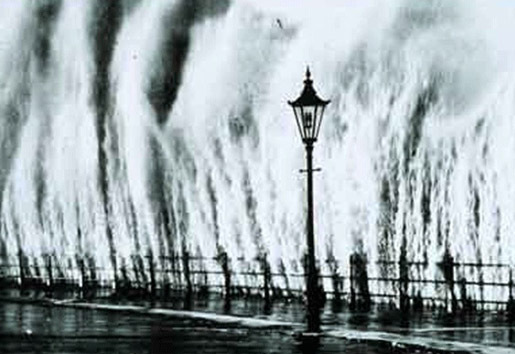 Storm surge from the 1938 hurricane at the Battery, in New York City. [Credit: NOAA/NWS Historic Collection]. In the summer of 1949, when Nicholas K. Coch was a young boy, his father took the family to pick berries in a New Hampshire forest. A forest fire had recently swept through and produced fertile ground for berry patches. Noticing that the trees were not only blackened by flames but were also broken, Coch asked his father why. His father told him that a huge hurricane had hit in 1938. Coch was astounded. They were far inland and nowhere in sight of the ocean, yet the storm’s footprint remained eleven years later. That childhood memory is still with him as he warns anyone who will listen that history can, and will, repeat itself. “No other hurricane comes close,” said Coch, now professor of earth and environmental sciences at Queens College. He was talking about the impact of the storm that tore through the New England states and devastated a widespread region with 30 to 50 foot waves and peak gusts of 120 miles per hour, even reaching Canada. A Category 3 hurricane of that force has not struck the New York region in almost 70 years, and the historical record suggests they hit about every 80 years. While hurricanes don’t exactly arrive on a timer, Coch and other experts are certain that New York City is more vulnerable today than ever. Massive coastal development projects continue even as city agencies brace for worst case scenarios involving major flooding. With a worst-case hurricane strike possibly costing billions of dollars, insurance companies are also pulling back on hurricane policies covering the New York region. New Yorkers back in September 1938 were clearly unprepared to consider the possibility of a hurricane touching their lives. A New York Times article published on the eve of the storm described hurricanes only as something to “strike terror into the hearts of Floridians and remind even far-away New York that nature is not to be trifled with when she is in one of her angrier moods.” Meteorologists gave storm warnings for the East Coast but expected the hurricane to move out to sea. Instead, the “Long Island Express” barreled north and picked up speed, eventually reaching 70 miles per hour and becoming the fastest moving Atlantic hurricane in recorded history. Eastern Long Island was hit by the storm’s eastern end, meaning that the forward movement of the hurricane combined with the counter-clockwise spin to produce gales of 180 miles per hour on that side. “You have to have been in a storm to realize what a hurricane can do,” noted Coch. He’s talked with 75 year old men on Long Island who break down and cry as they relive their storm memories. Waves of 30 to 50 feet crashed into the south shore of Eastern Long Island. The New York Times stated that fifty houses at Westhampton Beach alone were swept into the ocean, often along with families completely unprepared for disaster. The entire island plunged into darkness as storm tides of fourteen to eighteen feet flooded the coast, with Westhampton Beach’s main street inundated by eight feet of water. Downed trees and live wires made both travel and communication virtually impossible. The newspaper also reported that New York was virtually “transformed into a typical hurricane-belt city” due to 68 mile per hour gales, driving rain, and flooding. Ferry and subway services were disrupted, and washouts along the highways trapped thousands of office workers in their buildings. The Bay Ridge area of Brooklyn lost power shortly after 3 P.M., during the height of the storm. Areas of northern Manhattan and the Bronx also suffered power outages. Over 50 people died on Long Island alone. The Red Cross estimated 600 to 700 deaths across seven states and Canada, with thousands more injured during the hurricane. Several things have changed since that time. Forecasting and hurricane tracking has improved immensely, thanks to satellites, radar, and other technology. On the other hand, the potential storm impact on New York and other areas has grown dramatically with population increases. Largely a rural farming and fishing community in 1938, Long Island now boasts a population of approximately 2.83 million people and is one of the most affluent areas in the United States – especially along the shorelines. “As far as I could tell, there was no effort post-1938 to hurricane-proof anything,” said Scott Mandia, a Long Island resident since 1991 and professor of physical sciences at Suffolk Community College. He is a local expert on the 1938 hurricane, and has been interviewed by the Weather Channel about the impact of hurricanes. As Mandia and his family drive around Long Island today, his wife will point out house after house that sits along the shoreline. Mandia can only agree – yep, that’ll be gone in a hurricane. He voices disbelief that anyone would buy such vulnerable property, no matter how beautiful. “I think I’ve always had a respect for hurricanes and the power of moving water,” said Mandia. He convinced his neighbor to help cut down a large tree between their houses, observing they “both have small children” and the tree could easily topple on one of their houses in the next big nor’easter. Mandia worries that Long Island’s recent brushes with Hurricanes Gloria and Bob in 1985 and 1991 have lulled residents into believing that they have experienced the worst that hurricanes can throw at them. The quiet 2006 hurricane season, which undercut earlier predictions, hasn’t helped either. If the Long Island Express hit today, the overall economic costs could range from $37 billion to $39 billion in 2005 dollars, according to a paper by Roger Pielke, Jr. of the University of Colorado. That would make it the sixth costliest hurricane in U.S. history. Pielke and other policy and climate experts calculated direct damage losses based on increases in inflation, wealth, and population. The long term odds of a hurricane strike are also no comfort. The United States Landfalling Hurricane Probability Project gives a 73 percent probability that New York City and Long Island will be hit by a hurricane in the next 50 years, and a 26 percent probability that the area will be hit by a major Category 3 or greater hurricane. Looking toward the future, experts say it’s a question of when and not if. Yet the coastal buildings keep going up. Vivien Gornitz, a climate scientist at NASA Goddard Institute for Space Studies in Manhattan, ticked off areas of development in recent years: Jersey City, Hoboken, and Edgewater, among other cities, in New Jersey alone. “There’ve been major changes along the waterfront,” said Gornitz. “A lot more people are vulnerable even without sea level rise.” The sea level rise is a predicted consequence of global warming, and could lead to storm surges that flood further inland. She clicked through a power point slideshow, showing upward curves representing global temperatures and maps of the ocean eating away New York’s coastline. Gornitz contributed to a 2001 study for the U.S. Global Change Research Program that predicted a rise in sea level of 1 to 3 feet around New York City by the 2080s. Sea level rise occurs as warmer water expands and takes up more space, while melting mountain glaciers feed into the ocean – and this doesn’t even include the potential meltdown of the Greenland and Antarctic ice sheets. The study suggested that a sea level rise of as little as 1.5 feet by the 2050s could have disastrous results when combined with the perfect storm – a Category 3 hurricane on a worst-case track just to the west of the city. Flooding from such a storm could hit everything from southern Brooklyn and Queens to lower Manhattan, as well as Astoria and Flushing Meadows-Corona Park. Gornitz thought the city could take protective measures, but was skeptical when asked whether the city could be entirely hurricane-proofed. “Do you think they’re going to build a seawall all around lower Manhattan?” she asked in return. Perhaps the one good part of the story is that New York doesn’t lie below sea level like New Orleans, which was devastated by Hurricane Katrina in 2005. Instead of having to evacuate everyone from the city, the New York Office of Emergency Management (OEM) can have people in designated evacuation zones move inland to higher ground. That still presents some logistical nightmares for emergency officials, whom Coch, Mandia and Gornitz credit with waking up after Hurricane Katrina. “We’ve entirely revamped the hurricane plan,” said Andrew Troisi, an OEM spokesperson. OEM expects to move up to two million people inland in a worst case scenario, making use of the public transit systems and emergency vehicles. The agency has priority evacuation plans for the 500,000 elderly or disabled people living in the designated evacuation zones around New York, since that population was especially vulnerable during the New Orleans evacuation. “What we have to do is evacuate low-lying coastal areas, but we don’t need to get them all out of the city,” noted Troisi. He believes that the “vast majority” of New Yorkers would heed evacuation orders, given OEM’s public awareness campaigns and recent polling data. Yet even with weather forecasting providing advance warning, northern hurricanes move two to three times as fast as southern hurricanes, meaning there is less time for evacuations. If there is someone who is taking major action now about future disasters, it’s the insurance industry. Allstate, the largest insurance provider in the United States, has stopped selling new insurance policies for homeowners in New York City and Long Island. The company also decided not to renew a “small percentage” of homeowner policies, which could be an estimated 18,000 non-renewals according to a Yahoo! Finance consumer report, out of fear of a devastating hurricane strike. Insurance providers are paying attention because they “hold the purse strings,” said Mandia. But going by history, it’s questionable whether warnings and the loss of insurance policies will have much effect on coastal development or people’s behavior. The New York Times recorded the sale of a house at “Old Field South, Stone Brook” on Long Island during the height of the 1938 hurricane. The buyers “held onto their hats” and stuck with their purchase.